It's no secret that I'm a fan, and regular trader, at the superb Crafty Fox Market. The markets have been running for several years now, and I love to visit to shop as much as I do to stand behind my stall, so I'm delighted that Sinead Koehler has joined us on the blog today. Find out how the markets started, a little more about Sinead, and how important Just A Card is to markets and the designer/maker community as a whole. My name is Sinead and I run Crafty Fox Market - a shopping event which connects designer/makers and artists with savvy shoppers. It takes place seasonally in a variety of venues around London, and we are just about to run our first event in Leeds. We also host talks and meet-ups which bring our creative community together, and help them to improve their businesses. I am originally from Northern Ireland, but have been living in London with my husband Stephan for more than 8 years now. We have a 3 year old son called Rian, and our second baby is due in late August. Currently I work 3 days a week and look after my son on the other days. If it's a work day, we have breakfast together as a family, then I walk my son off to nursery which is a couple of minutes from our house. If I have meetings in town, I will work from the Exchange, a co-working space at Somerset House. Otherwise, I work from home in Herne Hill, South London. A typical day might involve a bout of social media, a planning meeting with Kayti who is based in Yorkshire and is Crafty Fox marketing manager, answering lots of emails and ticking a few things off the to-do list. I spend a lot of time liasing with venues and researching new opportunities. Each of our markets takes 2 months to produce as we run an application process, and work with guest curators to curate the stalls. We also put a lot of time and effort into promotion to make sure we reach relevant customers. After work, I enjoy cooking and find that it's a good way to wind-down. I try not to work too much in the evenings but in reality, there are often things to be done once my son is in bed. I feel constantly inspired by the creative people that I meet through my work, and I really enjoy the flexibility and variety that it provides me with. 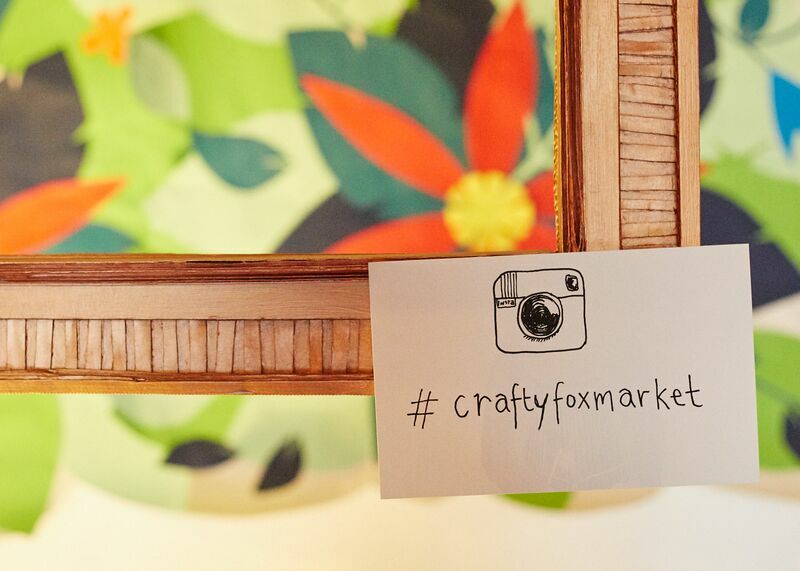 What drove you to start Crafty Fox Market? How and when did it all begin? I started Crafty Fox Market in 2010. At that time, we were living in Brixton and I was working full-time in events and communications for a university. I was looking for a creative outlet and had been making and selling jewellery online via Etsy and at markets for around 6 months. While I enjoyed making things, and loved being part of the creative community, my skills lay more in event management. The idea was to create a market with the makers at its heart, providing a supportive, affordable way for them to meet lots of customers. It was originally intended to be a one-off event, but after an initial success, everyone wanted more and soon we were managing a busy programme of activities. When I had my son, it made sense to take the leap and 'quit the day job' - I've never looked back! It's the most challenging thing I've ever done and I'm constantly learning, but I love what I do. I think it's difficult to make the financial side of things work while still maintaining the handmade integrity of a product. I see many makers struggle with pricing - trying to find that elusive balance between being paid properly for what they have made, and finding the right customers for their particular product. I also see makers struggle when demand outstrips their ability to produce a product, and they need to work out other methods of production in order to grow. Many makers work alone and there's lots to learn, so I think being part of a creative community can be really valuable for makers. Having a network that you can learn from can mean that you shortcut mistakes that you may have made otherwise. I find makers to be a really friendly, open community of people who are very willing to share their experiences and help others. Crafty Fox Market has a reputation for a great community atmosphere and hosts other events as well as the markets themselves. Please tell us a little more about these. Every month we will host either a free meet-up or a ticketed 'Crafty Fox Talks' event. The meet-ups are very informal - simply providing an opportunity for makers to get together in a variety of interesting locations around London. Our next meet-up is on 8th June at The Glebe House, a boutique B&B and event space in Clapham (RSVP here). Crafty Fox Talks have a more formal structure, usually with a panel of experts discussing a particular business related topic. Recently we held a really popular 'meet the buyer' event at The Hoxton Hotel where a panel of retail buyers answered lots of questions about wholesale and getting products into shops. The recording of the evening can be found in the resources section of our website. We are currently planning more topics for the latter part of the year, so keep an eye on the website for further details. At the beginning, I would say it's worth putting the time and effort into getting your product right, market research, pricing, creating a brand for your business and perhaps even setting yourself some achievable goals. However, don't do so much planning that you never get around to actually launching your business. I often meet makers who have spent many months working on a product line, but have never reached the point of actually launching. It can feel there is a never-ending amount of work to be done, and it's daunting to ask people to buy something that you have made, but at some point make sure you take the plunge and put yourself out there.... what's the worst that can happen?! Yes, I think the message of the Just A Card campaign is really great and it was clear to me that a card is just one example of a product type. It's definitely relevant to all makers, regardless of whether or not they sell cards, and it's a great way to start a conversation with potential customers. In today's environment, consumers are looking for meaningful purchases, and it's beneficial to remind them of the good that they are doing by supporting small businesses. That's one of the reasons why markets are a great shopping environment, because consumers get to experience the warm glow of making a purchase directly from the individual behind the product. It's a very important message and very relevant to Crafty Fox Market. We want all of our market traders to have a great day at our events, and while markets are definitely about more than just sales on the day, it's certainly an important part of the overall picture. There are many examples of customers who purchase 'just a card' from traders but then return at a later date, either online or in person to make a bigger purchase, or perhaps even make a commission. I love hearing about all the opportunities that our traders experience as a result of taking part in the markets - you really never know who will walk through the door and what opportunity it will bring. I think I first heard about the campaign directly from Sarah Hamilton who is has an infectious passion for Just a Card. I also follow The Design Trust and Mollie Makes on social media, so saw the campaign momentum building via their feeds. I mainly use Instagram, Twitter and Facebook - Instagram has been growing steadily for us over the past year, and it's fast becoming our most useful platform. It's a great way for us to showcase designers taking part in our markets. What do you think people can do to support Just A Card? Come along to our markets, bring friends and buy lots of fabulous things from our talented community of makers. Our next market dates are 28th & 29th May at the Dogstar in Brixton, South London followed by 4th & 5th June at the Black Swan in Leeds. There are different traders taking part each day, and full listings are available on our website, so even if you can't physically attend the markets, have a browse at the listings online where you will find links to all the individual online shops. I challenge you not to be tempted to buy something! !